Click HERE to go to the webpage where you can see the LIVE visualisation. The image above is an example of how the Bijlmer Euro visualisation works. The live visualisation shows you a real time aggregated history of how notes are moving around the Bijlmer. What does it show? How can I read it? The evolving visualisation will enable local people and shop keepers to see how money is moving in their local area, something which is totally unique in the whole world. Fundamentally the visualisation allows anyone to identify purchasing and movement patterns, making it possible to draw conclusions about the use of the currency and the benefits for the local shops. For example, we may find that money is moving from a gym in the Bijlmer to the local bakery and back again. Perhaps this is because people are exercising and then at lunch time going and buying their sandwich at the bakery and then returning back to the gym. That sort of pattern might suggest a symbiotic relationships between local business. In this example both enterprises could co-operate for mutual benefit by selling sandwiches directly at the gym. Another example could be that the money is flowing between two shops who sell similar goods. This will indicate that people are going to a number of different greengrocers not just one. That would suggest that both shops might want to talk to their customers about stocking a wider variety of goods or perhaps specialising. We may also find that money is not moving between two shops that could benefit from the mutual custom. This might be in incentive for the shop owners to discuss with their customers about setting up some co-operative offers. In general, it will be interesting to see to what extend money is moving between shops that are traditionally only associated with a single community. Perhaps what we choose to buy and in which local shops we buy it, can suggest a more complicated set of multiple identities for people in the Bijlmer. When customers scan their own RFID-tag at the mobile bank they can trace the history of the note in their wallet throughout the Bijlmer. Maybe they will discover some connections they had not expected and will now feel like explore some shops outside their normal area. 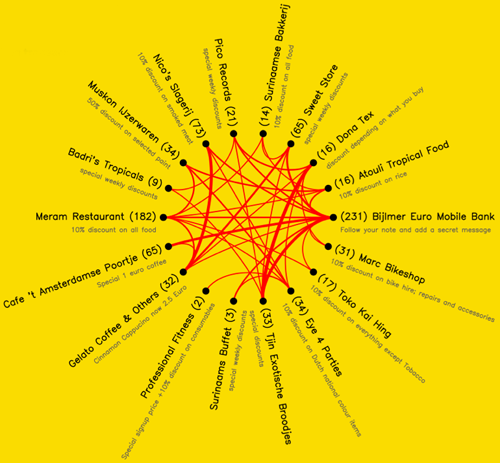 Hopefully the visualisation will contribute to the feeling of being connected to a rich and complex Bijlmer network of culture, economics and people. We hope that the visualisation will allow local shoppers to make their shopping choice more tactically and enable them to plan how to do all their shopping from local businesses. We hope that it will lead shop owners to be more receptive to feedback from local people and rethinking their supply chains and planning local collaborations.